The NAS had reported that one of it’s 6 disks had failed. The client had followed the recommended course of action and replaced the faulty disk but the NAS had then failed to rebuild. This meant the NAS had crashed and all the data on it was now inaccessible. With errors like this, one disk failing on this Seagate RAID 5 NAS will mean the system continues to work without loss of any data but in “degraded” mode, this means file and folder operations are slower as the NAS performs more calculations to serve the data required. By removing the faulty drive and replacing it with a new one, the NAS should have gone into an automatic rebuild which integrates the new hard disk into the RAID set. In this case the rebuild did not complete. This was due to problems with one or more of the other disks which the NAS had not yet detected. When the rebuild operation hit these problems it was not able to complete and thus the whole NAS failed, taking the files and folders offline. Analysis of the failed NAS showed that 3 out of the 6 disks in the RAID 5 had developed problems, and while the NAS had successfully detected a problem with one drive and recommended it be replaced, it had not detected problems with any of the other drives. To recover the data successfully would mean recovering the data from every disk bar one that made up the RAID, so at least 2 of the faulty disks would have to be accessed and data read from them before the files held on the NAS could be rebuilt and recovered successfully. 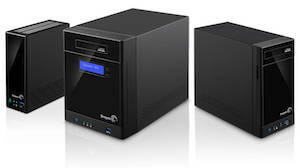 Data Clinic were able to fully recover all the data from this NAS. Seagate are a very popular manufacturer of NAS equipment, producing smaller (often 2 disk) storage hard drives for the home, usually operating either a RAID 0 (stripe) or RAID 1 (mirror) up to more business oriented NAS file servers, usually running RAID 6, but we have seen some running RAID 6, RAID 10 and RAID 50. Along with Western Digital, Seagate are the worlds largest manufacturers of hard disk drives.